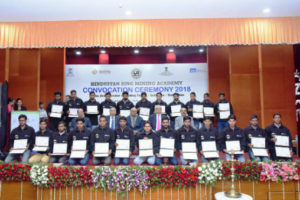 Udaipur: Hindustan Zinc Mining Academy, perhaps the only mining academy, set-up by Hindustan Zinc, India’s only and world’s second largest Zinc producer saw 1st convocation of 150 students that includes 103 Jumbo Drill operators and 1st batch of 47 Winding Engine operators. The ceremony was held on 24th January 2018 in Udaipur and was attended by Arun Kumar-Secretary, Ministry of Mines – KP Krishnan-Secretary, Ministry of Skill Development & Entrepreneurship – Sunil Duggal-CEO, Hindustan Zinc & Chairman of Skill Council of Mining Sector –R.K. Sharma-Secretary General Federation of Indian Mineral Industries – A.K. Bhandari-CEO, Skill Council for Mining Sector. All the 150 pass-outs are ITI Diploma holders and this is the first time such convocation ceremony has been organized by a private sector company. Hindustan Zinc has set-up Mining Academy at Bhilwara, Rajsamand and Zawar in Rajasthan, to meet the growing requirement of skilled manpower and generate employment opportunities, particularly in rural areas. The Mining Academy has been set-up in collaboration with ‘Skill Council for Mining Sector’ and training partner ‘Indian Institute of Skill Development Pvt. Ltd’. The Academy provides training to youths in Jumbo Drill Operations and Winding Engine Operations along with training in Banks-men and Bellman Operations. The growth of mining in India has resulted in huge demands for skilled operators to operate sophisticated mining equipment such as jumbo drill, winding engine, load haul dumper (LHD), low profile dumper truck (LPDT), etc. Speaking on the occasion Arun Kumar, Secretary Mines said, “In India, open-cast mining is more popular but rare minerals can only be found in underground mine. India is unable to find proper talent to operate the critical equipment of underground mines. Through this initiative of Hindustan Zinc, our youths will get employment opportunities in India and also in other International mines. Future is indeed very bright for these students”. The Secretary M/O Skill Development & Entrepreneurship, KP Krishnan said developing skills of ITI Pass-outs in Mining industry is important and an extension of PM’s Skill India Mission. When Skill-India mission was launched, Hon’ble Prime Minister Narendra Modi Ji had three important visions – Scale, Quality and Aspiration. He also wanted corporate to step forward and make this vision a reality. Through ‘Hindustan Zinc Mining Academy’, all the elements of Skill-India have come together. Employment of high wages is proof of skills becoming aspirational. Organizing convocation for the 1st time for the ITI pass-outs is indeed commendable. 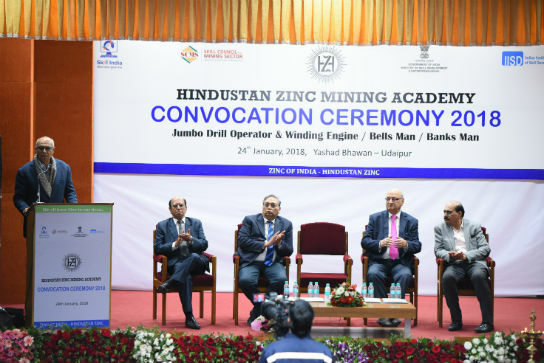 The CEO of Hindustan Zinc, Sunil Duggal, who is also the Chairman of Governing Board of ‘Skill Council for Mining Sector’, stressed upon enhancing further skills of these pass-outs to match the international standards. Why call expats in the areas where we can train our own youth and make them employable. He also informed that these youths have already been placed in different companies and the demand is set to increase. The Mining Academy pass-outs have already been placed with an average salary of Rs. 300,000 per annum. There has been 98% retention rate only proving that rural youth needs employability and they are ready to learn skills that can be used in the current sectors. Pavan Kaushik the spokesperson of Hindustan Zinc informed that the Company started the Mining Academy on August 1, 2014 with a sole objective to train ITI pass-outs in mining related trades so that they can be employed within the company and also provide manpower to several mining companies operating in Rajasthan, to begin with. We are very proud that we have aligned with the vision and mission of Skill India and determined to increase our scale of training. Our initial target is 500 youths and we have so far trained 300 youths in Jumbo Drill and Winding engine operations. Hindustan Zinc Mining Academy is a fully residential training program with provision for free boarding and lodging facilities for all the selected candidates in both the training programs. Along with practical training, 3-D simulator or training through virtual reality method is also provided to enhance their skills. Since it is a fully residential program, equal emphasis is given on soft skills, team effort, discipline, quality of life and overall personality development, which would further help them in securing sustainable livelihood in future. Also present in the event were Arun Kumar Chandel, Head, SSC Governance National Skill Development Corporation – S. Vijay Ayer-Managing Director, Rio Tinto India Pvt Ltd. – Arvind Singhal-Managing Director, Volkam India Limited – M.L. Lunawat-Managing Director Aravali Minerals & Chemicals – Dr. M.S. Singhvi- Managing Director, Rajasthan Parytes, HZL senior management, Business partners of Hindustan Zinc and HZL employees.